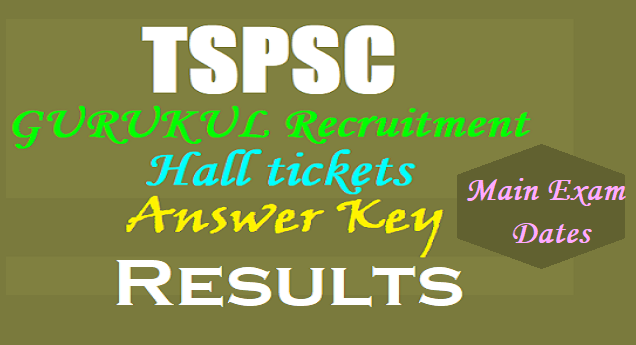 TSPSC PGTs, TGTs, PDs Recruitment Mains, Main Exam Answer Key, Results/ TSPSC TGTs, PGTs, PDs Preliminary Exam #Results/Eligible Candidates #ProvisionalList for TGTs, PGTs, PDs Main Exam/ Mains Candidates list. Mains selection list/ TSPSC PGTs, TGTs, PDs Recruitment Screening test results 2017/ TSPSC PGTs, TGTs, PDs Recruitment Preliminary Exam Results, Answer key, Main Exam dates 2017/ TSPSC PGTs, TGTs, PDs Recruitment Preliminary exam Answer key 2017/ Telangana Gurukul Teachers Preliminary Exam 2017 Question Paper with Key (Held on 31.05.2017)/TSPSC PGTs, TGTs, PDs Recruitment Common Preliminary exam Hall tickets 2017, Instructions: TSPSC Gurukulam Teaching,Non Teaching posts Recruitment 2017 hall tickets, TSPSC released the 7,306 Residential Schools/Gurukulam Teaching Non Teaching Posts Recruitment 2017(REIS Gurukul teachers) notification on 13-04-2017 and applications were invited from the eligible and interested candidates through online mode from April 18, 2017 to May 9, 2017. The TSPSC would fill the 7306 gurukulam posts in the 5 Residential Educational Institutional Societies in Telangana State. TSPSC would conduct the Screening Test/Preliminary Examination on May 31 to the TGT, PGT, PD, Language Posts and Telugu,Urdu,Hindi,Sanskrit Language posts of TGT, PGT Screening test to be conducted on June 14 and hall tickets are available on its website. WEB NOTE: The candidates who applied for the post of PGT (Notfn.No.13/17) and TGT (Notfn.No.14/17) languages posts i.e., (Telugu, Hindi and Urdu) are hereby informed that, the Question Paper for the Screening Test will be supplied in the particular language only i.e., the Telugu paper will be in Telugu language. However the questions related to Basic Proficiency in English will be in English version only for languages posts also. The entire Question Paper for Sanskrit will be in English version only. Notification No.s 13/2017, 14/2017 and 15/2017. Candidates must read all the instructions..
1. The hall ticket must be presented for verification along with at least one original (no photocopy or scanned copy) valid identification card (for example: Passport, PAN Card, Voter ID, Aadhaar­ UID, Government Employer ID, Driving License). Aadhaar Card may be carried by the candidate. 2. This hall ticket is valid only if the candidate's photograph and signature images are legible. To ensure this candidate is advised to get the print of the hall ticket on A4 sized paper using a laser printer, preferably a colour photo printer. 3. The candidates who do not have clear photographs or no photo on the hall ticket will have to bring two passport size photographs along with a written representation to Chief Superintendent in order to be permitted to appear for the test. 4. Candidates will be permitted to appear for the examination, ONLY after their credentials are verified by centre officials. 5. Candidates will be subjected to frisking to ensure that they are not carrying any electronic or any other gadgets, mobile phone, tablets, pen drives, Bluetooth devices, Watch, Calculator, Log Tables, Wallet, Purse, Notes, Charts, Loose Sheets Or Recording Instruments strapped to their body or pockets. Calculators are not allowed. 6. There may not be a guaranteed security facility for safe­keeping of valuable devices or personal belongings at the examination centre. 7. The gates of the Test Centres will be opened by 8.15 am and closed by 9.45 am. No candidate will be allowed to enter the examination centre after closing the gate. The checking procedure inside the test hall may include capturing bio­metric left thumbprint/ iris/photo capture. This is a security feature which will allow TSPSC to verify the identity of the candidate and also to check impersonation by any others. Therefore, they are advised not to apply any external substances like Mehndi, Ink etc, on their hands/foot. Candidates are instructed not to wear shoes, Jewellery, Chains, studs and also wrist watches to the Examination Centre. 8. The candidates should satisfy the Invigilator of his identity with reference to the signature and photographs available on the Nominal Rolls and Hall Ticket through valid Photo identification documents like Aadhaar, Pan card, etc. 9. No candidate should leave the examination hall till the Examination time ends. 10. The Commission would be analyzing the responses of a candidate with other appeared candidates to detect patterns of similarity. If it is suspected that the responses have been shared and the scores obtained are not genuine/ valid, the Commission reserves the right to cancel his/ her candidature and to invalidate the Answer Sheet. 11. (i)Wherever Written Examination is held, only those candidates who are totally blind are allowed to write the examination with the help of scribe and 20 minutes extra time is permitted to them per hour. (ii) An extra time of 20 minutes per hour is permitted for the candidates with locomotor disability and CEREBRAL PALSY where dominant (writing) extremity is affected for the extent of slowing the performance of function (Minimum of 40% impairment). Scribe is allowed to such candidates also. (iii) Scribe will be provided by the Chief Superintendent concerned to those candidates who do not have both the upper limbs for Orthopedically Handicapped. However, no extra time will be granted to them. 12. The candidates must note that his/her admission to the examination is strictly provisional. The mere fact that an Admission to the examination does not imply that his/her candidature has been finally cleared by the Commission or that the entries made by the candidate in his/her application have been accepted by the Commission as true and correct. 13. The candidates are expected to behave in an orderly and disciplined manner while writing the examination. If any candidate takes away Answer Sheet of OMR based examination, the candidature will be rejected and in case of impersonation/ disorder/ misbehavior during Examination, necessary F.I.R. for this incident will be lodged with concerned Police Station, apart from disqualifying his / her candidature. 14. Candidates trying to use unfair means shall be disqualified from the selection. No correspondence whatsoever will be entertained from the candidates. 15. The Penal Provisions of Act 25/97 published in the A.P. Gazette No. 35, Part­IV.B Extraordinary, dated: 21/08/1997 shall be invoked if malpractice and unfair means are noticed at any stage of the Examination, apart from debarring from future exams of TSPSC, Other State Public Service Commissions & UPSC. TSPSC reschedules exams for PGT, TGT, PD: Telangana State Public Service Commission (TSPSC) on Monday re-scheduled main examinations for Post Graduate Teacher (PGT), Trained Graduate Teachers (TGT) and Physical Director (PD) in Residential Educational Institutions Societies. According to a release, the TSPSC Gurukul PGT, TGT and PD main examinations, which were scheduled to be held on June 29, 30, July 4, 5 and 6 are rescheduled to July 18, 19, 20, 21 and 22. Accordingly, mathematics and biological science PGT exam will be held on July 18 while physical science and social studies exams on July 19. For TGT, mathematics and biological science exams will be held on July 20 and physical science and social studies exams on July 21, while science examination will be held on July 22. The TSPSC officials said the main exam for Physical Director was rescheduled to July 18. TSPSC Secretary A Vani Prasad said in the last few months, the commission had received several requests and representations from Gurukul teacher aspirants and student organisations requesting the reschedule the examinations, which will enable them to have more time for preparation. Web-Note :It is hereby informed that, the exams for the posts of PET, Art, Craft, Music Teachers, Librarian, Staff Nurse and Preliminary Examination for the posts in Degree Colleges (DL, PD and Librarian), Junior Colleges((JL, Principal, PD and Librarian) & Principal in Schools and Main Exams for TGT (Physical Science, Social and Science) are re-scheduled as follows. (TSPSC TGT, PGT, PD Preliminary Exam Results): The candidates are directed to visit Commission’s website www.tspsc.gov.in for further details. Hall tickets for Written Examination for the Post of Trained Graduate Teachers in Residential Educational Institution Societies Main Examination (General Recruitment)Notification No 14/2017. Hall tickets for written Examination for the Post of Post Graduate Teachers in Residential Educational Institution Societies Main Examination (General Recruitment) Notification No 13/2017 . Hall tickets for Written Examination for the Post of Physical Director (Schools) in Residential Educational Institution Societies Main Examination (General Recruitment) Notification No. 15/2017. The Telangana State Public Service Commission (TSPSC) has extended the last date up to August 31 for receiving objections to the preliminary key of the main examination for Post-Graduate Teachers (PGTs- in Mathematics, Biological Science, Physical Science & Social Studies) and Trained Graduate Teachers (TGTs- in Mathematics & Biological Science) conducted from July 18 to 20. Earlier, the last date for receiving the objections was August 27. A press release issued by the TSPSC Secretary advised the candidates to submit their objections through the link provided. Objections received after August 31 will not be considered, the release said. Candidates have to submit the objections only in English and only as per the order of questions appearing on the screen with the question numbers allotted by the TSPSC. PGTs Main Exam on 27/Aug/2017(Telugu,Hindi&Urdu) and 28/Aug/2017(English). Hall ticket Download for Notification no. 13/2017 Post Graduate Teachers in Residential Educational Institution Societies Computer Based Recruitment Test. Please explain art web notification & revised breakup pdf file in what's new.